Germany's highest scenic road is an unforgettable experience. Situated at an altitude of 1600 meters, you will enjoy unique and memorable moments at an incredible height with gorgeous views of the Berchtesgaden Alps countryside and the 'Salzach' Valley with the Mozart city of Salzburg more than 1000 meters below. It is easy to navigate by car or bus and, of course, a popular motorcycle tour route. 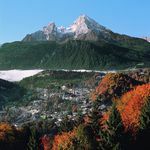 There are many popular starting points for mountain hiking with destinations to Purtscheller House (1692m ) or Eagle's Nest (1834m), just to name a few.